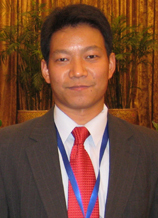 Bruce obtained his BS in Chemistry from Peking University, Ph.D. from Dartmouth College, and MBA from University of Iowa. He did his postdoc research on drug molecule synthesis at Duke University. He has worked in pharmaceutical and nutraceutical industry for over 10 years on new product development and commercialization. In 2010, he founded ACB SciTech, Inc. to supply high quality raw materials to pharmaceutical and nutraceutical companies in North America. ACB SciTech is also committed to introducing new pharmaceutical and nutraceutical products to China.